Inspired by conversations on the FOOD52 Hotline, we're sharing tips and tricks that make navigating all of our kitchens easier and more fun. Today, Amanda learns how to sharpen her knives. Is there anything better than chopping, slicing, and dicing with a good sharp knife? Not really. We have to admit that we're guilty of letting knives go dull in our test kitchen. All of that changed when our talented developer, Amanda Li, showed up to a photo shoot with her sharpening stone. Not only does she keep the site up and running, she recently graduated from culinary school and she keeps every knife in the test kitchen nice and sharp. Today, she teaches Amanda Hesser how to do it herself. How do you sharpen your knives? We want to know all of your knife-maintenance tips! Today's video was shot by Alex Lisowski, and edited by Kyle Orosz. watched the video on sharping knives. Wondering were can you purchase one of this stones? how does one sharpen serrated knives?! these are not demonstrated on the video! 2)If you want to get it up a few notches, get the edgepro sharpening equipment, you'll get almost professional results without the big learning curve involved in freehand sharpening, and you'll get "scary sharp" edges without scratching or damaging your knives. 3) My favorite... Freehand sharpening, get a set of at least 3 different stones (Coarse, medium and fine grit), a good strop, a nice ceramic honing rod and get ready to learn. I'm a knife junkie and I enjoy big time to have a razor sharp (And I mean... really razor sharp) blade that cuts easy and clean thru veggies and meats. There is nothing like the sensation and the results of a nice sharp edge. If you want to get serius in the subject , there are a couple of great suppliers of knives and sharpening gear one is chefknivestogo and the other is japaneseknivesimports both sellers are top notch and absolutely professionals . Best regards. The AccuSharp knife sharpener on Amazon is the best $9 I've spent. Totally idiot proof. The downside is it only works on Western-style knives. Bobby has some great advice. Before home cooks try their hand at sharpening, I would advise spending some time to read up on the topic and educate themselves on it before potentially messing up their expensive knives. If in doubt, get your knife sharpened by a professional and by that I mean someone who specializes in different types of knives and steels, not your neighborhood butcher. Also, please don't run your knives through electric machines that just mangle up your edge. Once your knife is sharpened, the best thing you can do for it is to use a honing steel to re-align the edge before or after each use. A steel does not sharpen an edge, it just brings things back in-line. Great video--I love this series! One question I've had for a long time but haven't ever gotten around to asking: what kind of knives does Amanda have? They're beautiful! That knife was a gift from her brother-in-law. He brought it back from a trip he took to Japan -- lucky her! She's also got knives by henckles and global in the kitchen. Also lots of gorgeous knives she's picked up over the years that don't have brand names on them. Great video. I think its important to add that the method shown should only be recommended for Japanese knives with a 50/50 bevel. 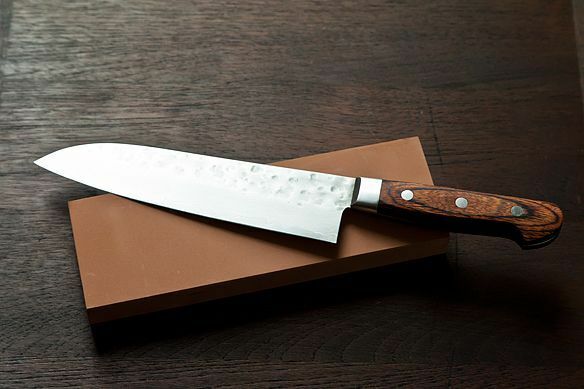 Some japanese knives only have a one sided bevel or a 80/20 which changes how many strokes per side you sharpen. Also non Japanese knifes like wusthof or henkels have softer steel, therefore the penny trick gets too shallow of an angle (approx. a 12.5 degree angle). By all means use a stone for non japanese knives, just stand up the knife for a 90 degreee, half it once for 45 degrees and one more time for about 22.5 which is closer to where you want to be to get lasting sharpness. bobby - that's a very good point about the one-sided bevel. thanks for bringing that up! i've had relative success using the stone on my western knives but i find it takes a little longer to sharpen or re-make the edge (if it's been completely dulled) since western blades are so thick. will try using the 90-45-22.5 sharpening method, thanks! You can also try adding a few coarser stones to your kit, such as a 500 or 700.